David Baron: Why Should You Experience A Total Solar Eclipse? Part 3 of the TED Radio Hour episode Where Joy Hides. The moment David Baron saw his first total solar eclipse in 1998, he was hooked. He's spent the last 20 years chasing them across the globe—all for a few minutes of joy, wonder and awe. David Baron is a journalist, author, and avid umbraphile who has spent most of his career in public radio. He has been a science reporter for NPR, WBUR, and PRI's The World. His work has also appeared in publications like the New York Times, Los Angeles Times, and the Daily Beast. Baron has won a number of journalism awards, including the Lowell Thomas Award from the Overseas Press Club of America, the Alfred I. duPont Award from Columbia University, the National Academies Communications Award, and, on three occasions, the annual journalism prize from the American Association for the Advancement of Science. He is currently a scholar in residence at the University of Colorado's Center for Environmental Journalism. Baron is the author of the 2017 book American Eclipse. He has seen six total solar eclipses so far. So what is an umbraphile? DAVID BARON: (Laughter) An umbraphile - well, it - literally, a lover of the shadow. But it's specifically someone who loves being in the shadow of the moon - an eclipse chaser. It's a fancy word for an eclipse chaser. RAZ: And you are an umbraphile. You find your joy chasing eclipses. RAZ: This is David Baron. He's a science writer. UNIDENTIFIED PERSON: Skies will appear a little darker across North America. BARON: It actually started when I was working for NPR. BARON: The first thing that should be said about today's eclipse is it will never be safe to view directly with the naked eye. A partial solar eclipse was set to cross the country. And I interviewed an astronomer to find out what was going to happen, where you would want to go, how to view it safely. JAY PASACHOFF: This is an eerie effect that you don't necessarily notice exactly what's happening, but you do know there's something wrong. BARON: And it was this astronomer - his name is Jay Pasachoff - who, in the course of the interview, explained to me that as interesting as this partial solar eclipse was going to be, it was nothing - absolutely nothing compared with the grandeur of a total solar eclipse. BARON: For National Public Radio, I'm David Baron. At the end of the interview, he said, you know, before you die, you owe it to yourself to experience a total solar eclipse. And he said it with such sincerity and such passion that he got my attention. And I looked into it. And I decided I would actually go see one. RAZ: David Baron picks up his story from the TED stage. BARON: Now, a total eclipse is visible only along a narrow path about a hundred miles wide. And that's where the moon's shadow falls. It's called the path of totality. And in February 1998, the path of totality was going to cross Aruba. So I talked to my husband, and we thought, well, February, Aruba - sounded like a good idea anyway. So we headed south to enjoy the sun and to see what would happen when the sun briefly went away. Well, the day of the eclipse found us and many other people out behind the Hyatt Regency on the beach, waiting for the show to begin. And we wore eclipse glasses with cardboard frames and really dark lenses that enabled us to look at the sun safely. And a total eclipse begins as a partial eclipse. So first, it looked like the sun had a little notch in its edge. And then that notch grew larger, turning the sun into a crescent. And it was all very interesting. But I wouldn't say it was spectacular. I mean, the day remained bright. If I hadn't known what was going on overhead, I wouldn't have noticed anything unusual. Well, about 10 minutes before the total solar eclipse was set to begin, weird things started to happen. A cool wind kicked up. Daylight looked odd, and shadows became very strange. They looked bizarrely sharp as if someone had turned up the contrast knob on TV. And then I looked offshore. And I noticed running lights on boats. So clearly, it was getting dark, although I hadn't realized it. Well, soon it was obvious it was getting dark. It felt like my eyesight was failing. And then all of a sudden, the lights went out. Well, at that, a cheer erupted from the beach. And I took off my eclipse classes because at this point during the total eclipse, it was safe to look at the sun with the naked eye. And I glanced upward. And I was just dumbstruck. BARON: ...At the sun. And I understand the enormity of space and the fact that I am nothing and powerless in the face of it. BARON: For the first time in my life, I just felt viscerally connected to the universe in all of its immensity. Time stopped or it just kind of felt non-existent. And what I beheld with my eyes, I didn't just see it. It felt like a vision. And I stood there in this nirvana for all of 174 seconds, less than three minutes, when all of a sudden, it was over. The sun burst out. The blue sky returned. The stars and the planets and the corona were gone. The world returned to normal. But I had changed. RAZ: When we come back - how David went on a mission to see as many solar eclipses as possible. On the show today, ideas about finding joy in the everyday and the extraordinary. I'm Guy Raz, and you're listening to the TED Radio Hour from NPR. RAZ: It's the TED Radio Hour from NPR. I'm Guy Raz. And on the show today, ideas about seeking joy. And we were just hearing from science writer David Baron and his first encounter with a total solar eclipse on a beach in Aruba. We always hear about, you know, these - about eclipses - total eclipse is a once-in-a-lifetime opportunity. So at that point, you're thinking, well, I'd have to wait a long time to see the next one, right? BARON: Well, right. If you are waiting for one to come to you, it is probably a not even once-in-a-lifetime experience because any given point on Earth will see a total solar eclipse only once every 400 years or so. BARON: On the other hand, if you decide to travel, you could see many in your lifetime. You could see several dozen. BARON: This is how I spend my time and hard-earned money. Every couple of years, I head off to wherever the moon's shadow will fall to experience another couple minutes of cosmic bliss and to share the experience with others - with friends in Australia, with an entire city in Germany. And over time, I've become something else - an eclipse evangelist. And so let me tell you before you die, you owe it to yourself to experience a total solar eclipse. It is the ultimate experience of awe. Now, that word awesome has grown so overused that it's lost its original meaning. True awe, a sense of wonder and insignificance in the face of something enormous and grand is rare in our lives. But when you experience it, it's powerful. Awe dissolves the ego. Indeed, it promotes empathy and generosity. There is nothing truly more awesome than a total solar eclipse. RAZ: It sounds like this is probably - comes closest to the sort of the height of joy that you can or have experienced, I guess. Is that right? BARON: Yeah. But, you know, it's - I think joy is too simplistic a word. Depth of feeling - it brings up so many feelings - yeah, probably the most joyful and just the most deeply moved. I don't have kids. I imagine watching one's child be born, that's got to be up there, right? BARON: I haven't had that experience. I have been with my mother, my grandfather, my mother-in-law when they died. That was not - none of those were joyful experiences. But those were deeply, deeply moving and important experiences. And it's kind of up there with that, that, you know, we all go through our lives busy with day-to-day affairs. And that's what we need to do, right? And I don't think you could live every day thinking deep thoughts all the time. But I - for me, anyway, it's really important to take time out just to appreciate being alive. I do appreciate the marvel that I'm here in this amazing universe. RAZ: Do you, in a sense, kind of measure time now as the time between one eclipse to the next? BARON: Yeah. I mean, it's nice to have this kind of different ordering to my life and also, looking backwards at sort of - these are milestones in my life that I can look at. 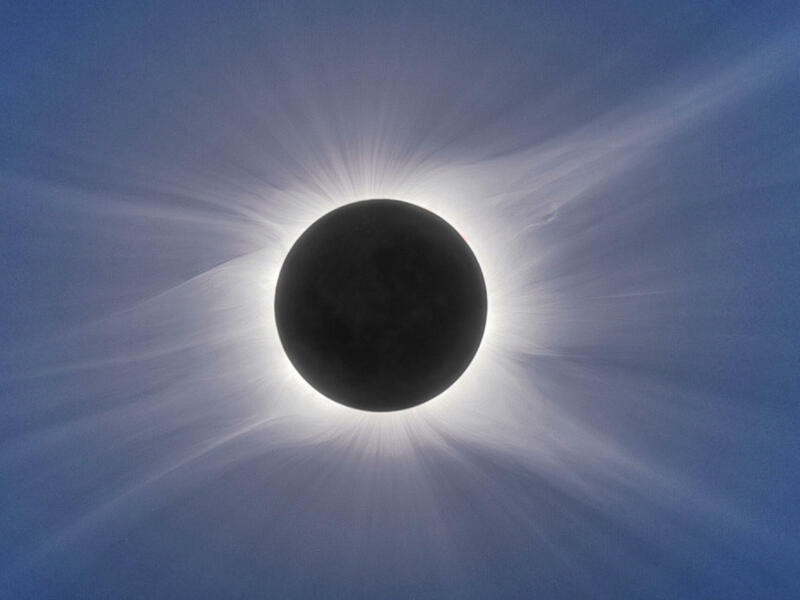 I remember - I mean, I remember these eclipses so vividly - where I was and what the solar corona looked like. And it makes me think about myself in those different periods of my life, who I was with. You know, they're sort of like time stamps that are marked in my brain. BARON: What if we all stood together, as many people as possible, in the shadow of the moon? Just maybe this shared experience of awe would help heal our divisions, get us to treat each other just a bit more humanely. Now, admittedly, some folks consider my evangelizing a little out there, my obsession eccentric. But when I think of my own mortality - and I do a lot - when I think of everyone I have lost, my mother in particular, what soothes me is that moment of awe I had in Aruba. I picture myself on that beach looking at that sky. And I remember how I felt. My existence may be temporary, but that's OK because my gosh, look at what I'm a part of. Cherish those moments of deep connection with other people, with the natural world and make them a priority. Yes, I chase eclipses. You might chase something else. But it's not about the 174 seconds. It's about how they change the years that come after. Thank you. RAZ: That's David Baron. He's a science writer, and his latest book is called "American Eclipse." You can see his full talk at ted.com.